The folk rock four-piece's latest album Babel climbed 15 places to the number one spot in its 41st week in the Official Albums Chart. 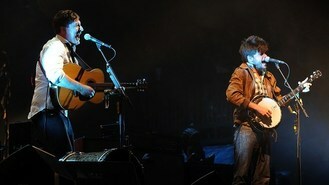 Their 2009 debut album Sigh No More also rose to number 12 following their appearance in Somerset last weekend. Editors, who also performed at the world famous festival, went straight to number six with their new offering The Weight Of Your Love, while Tom Odell who graced the event's BBC Introducing Stage was at number three with his debut album Long Way Down and Jake Bugg, who went down a storm on the site's Pyramid Stage, climbed to number four with his eponymous debut album. Michael Buble's previous chart topper To Be Loved was at number three in the album chart. John Newman, who previously reached number one as a featured artist on Rudimental's hit Feel The Love, went straight to the top of the chart with his debut solo single Love Me Again. US R&B star Robin Thicke's Blurred Lines featuring TI and Pharrell Williams was at number two while Icona Pop's I Love It featuring Charli XCX was in third place in the singles chart. Yorkshireman Newman said: "Love Me Again is a song I wanted to produce that threw all my influences together. "I thought I'm gonna put my DJing in, my house side and my hip hop producing from when I was a kid, and my general songwriting. "Also everything I'd been doing before, the kinda soul thing, and threw a song together that had cinematic pieces in, and 90s house, all underlying this lyric that explained a bad situation that I'd been through with my girlfriend which I managed to overcome by asking her that cheesy line that became the song title."